If you’ve read my weekly running report for the end of June, you know I had an awesome rain run on July 1. Part of it being awesome was that I knew it was going to rain and preparing for that. 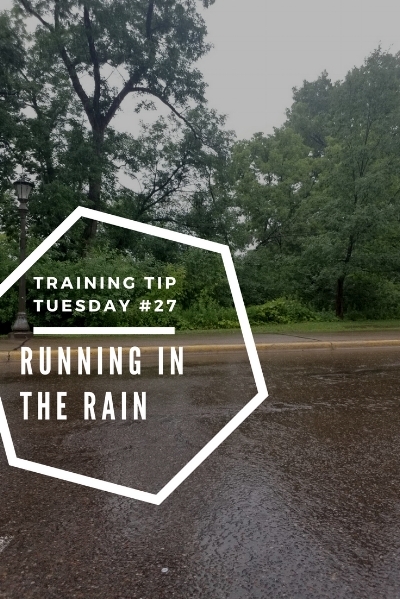 So today I’m sharing some tips to help you prepare for a rainy run! Nothing is worse than having rain constantly hitting you in the face (or not being able to see because your glasses are covered with rain). Even when it was downpouring on my run, I had no problems with visibility because of my hat! Wearing extra clothes will not keep you drier and you’ll just end up being weighed down by heavy, wet clothes. My tip for getting dressed for a rainy run is to wear the same clothes you’d wear if it wasn’t raining! I always use BodyGlide on my thighs when I’m wearing shorts but rainy runs I use it all over. Even though I don’t normally get chafing, I make sure any place clothing might rub is lubed up and between my toes as well. This is the one thing I didn’t do. I didn’t bring extra clothes, shoes or even a towel to sit on so I drove home very soggy. And my car seat was still wet the next morning...Just being able to change into some slip on shoes or sandals would have made me feel so much more comfortable on the drive home. I hope these tips help you have a better run the next time it's raining! Don't forget to share your own tips in the comments.